Following a wonderful concert in October, (Mozart's Requiem, which some of you may have attended and, hopefully, enjoyed) we are now hard at work preparing for our joyful Christmas Carol Concerts! 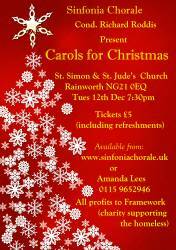 Please join us at Patchings Farm Arts Centre on Sunday, 10th December at 7.30pm (tickets £8.50) or at St Simon and St Jude’s Church, Rainworth, at 7.30pm on Tuesday, 12th December (tickets £5.00). It would be lovely to see you for some festive fun - audience participation and tasty mince pies are included at no extra cost! Tickets for the Patchings concert are available in advance from Patchings. Tickets for the Rainworth concert are available in advance from Amanda Lees on 0115 9652946 or through PayPal on our website. There is also the option of purchasing tickets on the door for both concerts, but these events do tend to sell out…! In addition, our hugely popular Come and Sing event will be taking place on Saturday, 20th January 2018 at St Michael and All Angels Church, Bramcote, Nottingham, from 9am until 5pm. We will be singing the much-loved Duruflé Requiem and several Bruckner Motets, directed by the ever-professional and enthusiastic Richard Roddis. It’s a mere £20.00 for the whole day, or £25.00 if you would like a delicious lunch, too! Please see our website for booking forms. If the Come and Sing inspires you, please come to our performance of the Duruflé Requiem at St Barnabas Cathedral, Derby Road, Nottingham, on Saturday, March 3rd, 2018, at 8.00pm (tickets £12.00). It should be a memorable evening of beautiful music. We look forward to seeing you there and at our other events. Best wishes from your friends in Sinfonia Chorale, and thank you for your continued support and interest in the Choir.